GUEST BLOG—By NASA’s Ian O’Neill--Personally, I'm a huge fan of candid arm's length photography, especially when I'm exploring a new place alone. 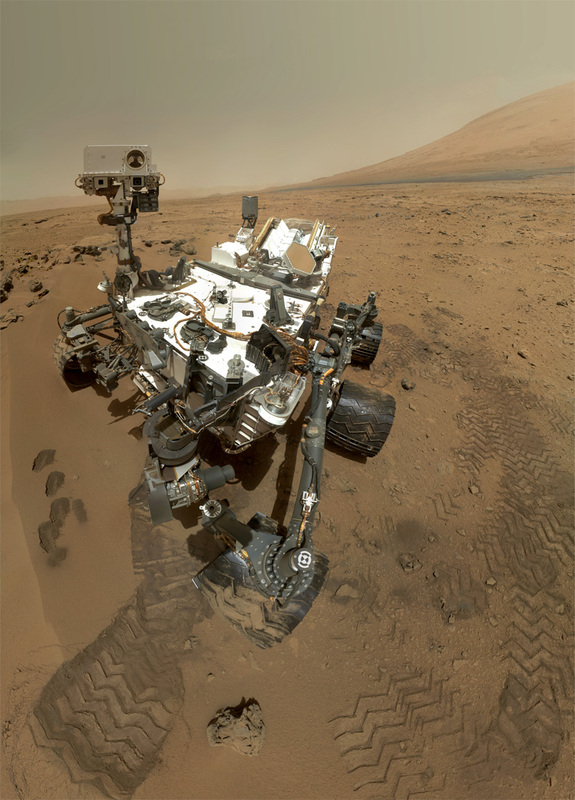 But for the one-ton Mars rover Curiosity, self portraits are becoming an essential staple of its time on the Martian surface. What's more, the rover is kitted out with a huge array of wonderfully advanced cameras, one of which -- the Mars Hand Lens Imager (MAHLI) -- is mounted perfectly at the end of its 2-meter long robotic arm. In this intimate scene we can see Curiosity, as if in mid-playtime, in its Mars sandbox -- a geologically interesting area called "Rocknest." In the lower left are the scoop trenches where samples of Mars soil have been excavated and in the upper right, the base of Mt. Sharp (the unofficial name of Aeolis Mons, a 3-mile high mountain in the center of Gale Crater). Wheel tread-marks surround the rover. This image is composed of a mosaic of 55 high-resolution photos. Apart from providing a great portrait of our beloved robotic emissary on Mars, these photos provide the MSL team with an invaluable means of keeping track of dust buildup and wheel tread wear. Although Curiosity is still relatively shiny and new, as the years march on, we'll likely see marked changes in its appearance. If its still-functioning rover cousin Opportunity is anything to go by, Curiosity will be coated in a rusty orange coat in no time at all. Go to the NASA JPL mission site to download the incredibly detailed high-resolution version.